This was a record even for me! At the time I set up to paint this scene, the temperature was -17, the coldest it has ever been for me to be out painting. Although it is still working from direct observation, in winter I paint from the car or “du siege avant” in French – maybe technically not “en plein air”, but the effect is the same. Since it was so cold, even the car stayed cold for quite some time leading to some frozen brushes and a desire to paint and get back indoors – quickly! 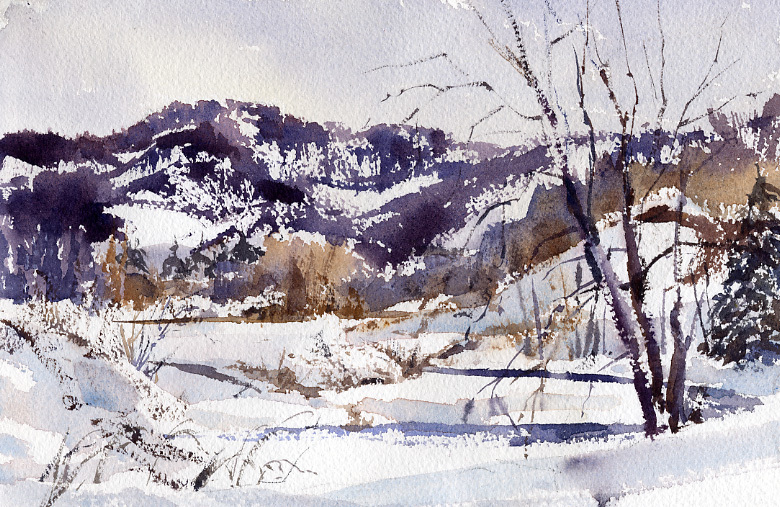 The desire to get a painting of a snow covered landscape done quickly led to a different choice of materials and techniques. For this painting, I worked on rough paper and with less water than I normally would. The contours of this dramatically rolling landscape reminded me of a roller coaster. I wanted to capture that rolling movement in the painting and to depict the patterns of light and dark created by snow laying deep among the trees. Rendering the look of snow between trees in a forest lent itself to rough-edged dry brush work; perfect for rough paper and less water! The combination of paper, dry-brush technique and the amount of white paper that would be left essentially un-touched meant fast work!